Healthcare: Would A Public Option Help Connecticut? Connecticut healthcare insurance premiums are expensive, pricing out too many individuals and businesses. This session, lawmakers are considering whether to create a public insurance option, accountable to government, to bring down costs. Important questions include who to cover, what to cover, how much to pay providers, how to fund it, and, most important, will it help make insurance affordable? Should it be built on Medicaid, the state employee plan, or should we create something different? What would happen to the current market, to employer-sponsored insurance, to AccessHealthCT, and to Medicaid? 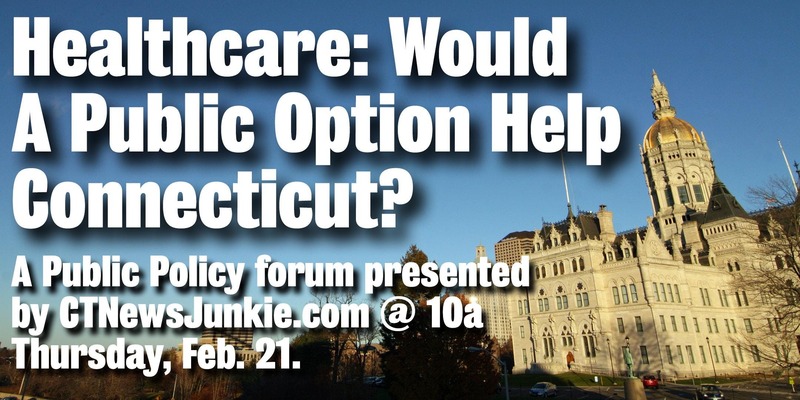 This is the second CTNewsJunkie policy forum to bring together policymakers and experts to explore potential benefits and risks. Join us February 21 at 10 a.m. at the state Capitol. We have reserved Room 310 in the state Capitol building CTNewsJunkie members will have the option to reserve seats up front but all are welcome.